At the foundation of NE Solutions – our Personal Concierge Solution supports all of our time-poor clients, and it’s for those who understand the value of having someone else do those time-consuming tasks. When there is simply not enough time in the day to do it yourself – then why not outsource part of your life or your to-do lists. It’s become so popular that you can get a Personal Concierge with your credit card – but would they personally wait for a tradie at your house – or pick up your dirty laundry to take it to the dry cleaners? Could you do with a Personal Assistant who is at your beck and call? Have you thought about hiring someone, but really are not sure on whom to trust or would possibly take advantage of you? All our Personal Concierge’s are fully insured, have police clearances and are highly skilled. We assist with ne: thing – urgent, emergency needs, special occasions – even down right mundane tasks that you just hate doing or don’t know how to do! Our team of Personal Concierge’s go above and beyond and have assisted Clients from our other Solutions too! They say you can only Spend Time – when actually with NE Solutions you can BUY TIME! With a Gift of Time – you can offer someone a truly unique and special gift – Time they never thought they had! Think what they would do with an extra couple of hours or more – of free time. Maybe with a Gift of Time you could actually spend some quality time together? With the ne:Time Gift – it can used in whole or parts during a 6 month period, for absolutely ne:thing when you or they are needing a helping hand. Whether it’s Business Support, a Lifestyle Change or having their own Personal Concierge – time is irrelevant when someone else is taking care of it! Lisa, from Victoria, called ne: at 11.30am one morning to see if we could assist with an urgent matter for her MD. Lisa’s boss needed a white or blue iPhone 5s for her father’s birthday. The phone was to be delivered to a specific courier, who was wrapping it up with balloons and wine, and delivering them at 3pm that afternoon. Only problem was no one wanted to sell Lisa a brand new iPhone over the phone, for someone else to collect it! We told Lisa it was no trouble for a Personal Concierge to purchase an iPhone on their behalf and undertook a few security checks to ensure that task was legitimate. Our ne: Personal Concierge then sourced and secured the iPhone through preferred local suppliers (as the iPhone 6 was coming out a week later, many of the stores were low on stock) and treble checked with the retailer that the phone was white and with 16mb, as per Lisa’s specifications. With time being of an essence, we contacted the courier for the drop off location, whilst the Personal Concierge was on the road. Once the iPhone was purchased, the primary PC, who was just leaving the retail shop, received the destination for the drop off – over the other side of the city. Delivery of the iPhone was completed by 1.30pm and Lisa was extremely happy that she was able to complete the task for her boss; who had made her father’s birthday just perfect. Zac was planning a special romantic dinner for his girlfriend, and had planned everything to the last detail. However, the one thing he couldn’t physically do was purchase a specific dessert and barista coffee, and make sure it was hot and just perfect for after the dinner. So Zac sent through a connect form to ne: requesting our solution to his dilemma. Deliver between 7 – 730pm on a Friday night. We confirmed his predicament was a solution easily fixed. By mapping out the route, pre-ordering the items and taking into consideration traffic and issues on a Friday night – Zac was able to surprise his girlfriend with her favourite dessert and coffee just at the right moment. ne: brownie points to Zac. Christmas 2013 ne: was connected by Richard Graham of Vogt Graham Lawyers. 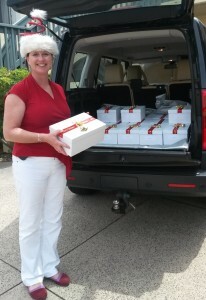 He had 25 gift boxes that he wanted personally delivered to clients and colleagues, all over Perth and surrounding suburbs, and with a smile. ne: way of making a client smile is appreciation enough, so to make someone else’s clients smile is always an honour. We confirmed the date of delivery and had mapped out the easiest and quickest route, taking into consideration specific requests of certain time of delivery. After collecting the beautifully presented gift boxes from Richard’s home, two Personal Concierges spent the morning delivering them with a smile and a Santa hat. Not only did we have comments on the hat from the recipients, but what a nice personal touch to receive with gift with a Merry Christmas. We always go above and beyond our client’s expectations to present them in the best light.